John Schnatter, who founded the Papa John's pizza chain in the 1980s, is leaving the chief executive seat. He'll stay on with the company as its chairman, the company said Thursday in a press release. Replacing him is Steve Ritchie, the current chief operating officer. The change will take effect on January 1, the company said. There was no reason given for the change in leadership. Papa John's is a major NFL sponsor, and Schnatter wasn't shy about sharing his thoughts about players who took a knee during the national anthem to protest the treatment of black Americans, particularly by police. President Trump earlier this year publicly criticized players who chose to kneel, ratcheting up the controversy. "This should have been nipped in the bud a year and a half ago," Schnatter said on a conference call with investors in November. "The controversy is polarizing the customer, polarizing the country." During the call, he also blamed the controversy for dismal sales. Backlash ensued on social media and his remarks were criticized by those who argue the players are exercising free speech and should be permitted to do so. Late-night comics lampooned Schnatter. And, adding to the ordeal, the white supremacist website Daily Stormer floated the idea that Papa John's was the "official pizza of the alt-right." That forced the Louisville, Kentucky-based Papa John's to issue a clarifying statement asserting, "We condemn racism in all forms," according to the Courier-Journal. About two weeks after Schnatter made his controversial comments, the company attempted an apology on Twitter. "The statements made on our earnings call were describing the factors that impact our business and we sincerely apologize to anyone that thought they were divisive," the tweet read. "That definitely was not our intention." 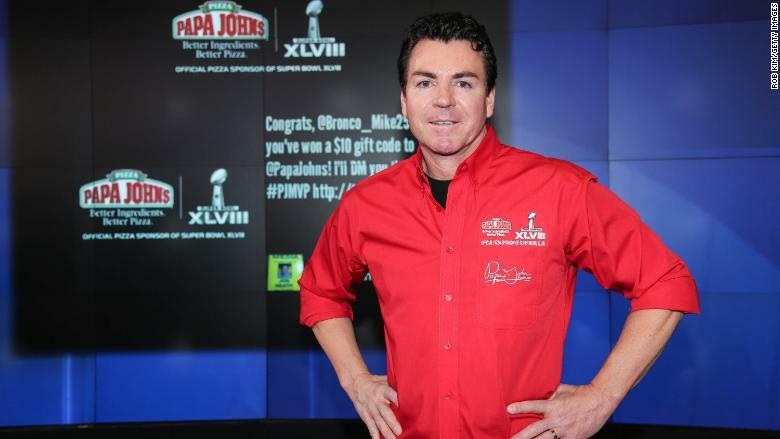 Papa John's has also faced waning sales recently. The company's stock price is down more than 30% so far this year. Ritchie, Schnatter's replacement, joined Papa John's as a customer service rep in 1996 making $6 per hour. He went on to own a Papa John's franchise, and in 2014 he was promoted to chief operating officer. --CNNMoney's Ahiza Garcia and Rob McLean contributed to this report.